In August 2014, residents of Qingpuling Village in Fujian Province won a lawsuit against a local waste disposal company after a 5-year-long legal battle . The polluting company, which emitted heavily toxic pollution to the country’s environment, was ordered to pay 6 million yuan ((US$976,626) to villagers in compensation for the damages caused to their health and local eco-system . The Fujian Solid Waste Disposal Company was set up in Qingpuling Village, Fujian Province in 2000, specializing in incinerating medical waste from Fuzhou, the regional capital and its peripheral areas . The company was originally managed by Provincial Environmental Protection Bureau until it was sold out to a private business in 2006 . As a result of improper techniques, weak supervision and its remote location, the company was reported to have illegally dumped its toxic wastes more than once, causing an environmental catastrophe to the village (ibid). Trees near the company do not bear fruit since 2003. Black smoke with stench smell was pouring out from the disposal site. The stream for irrigation turned black and fruit trees withered and died . What’s worse, the disposal company sited at the hill cove, which brought waste gas to more than 300 residents living around and polluted the stream nearby. Villagers broke out in red rash when they came into contact with the water from the polluted stream . As suggested by statistics from Liu, a Beijing-based volunteer lawyer, eight villagers died of cancer from May, 2009 to Jan, 2010 with an average death rate of 1.75%, among which, three of the dead lived facing the draining outlet of the plant . In 2009, with legal assistance from professional lawyers, 394 villagers launched a collective lawsuit against the plant in represent of nearly 600 residents in the village, claiming for compensation for 10 years’ economic loss, soil test and relevant measures to recover the soil productivity and an overall health examination for villagers. In October 2010, the case was accepted by the local court . 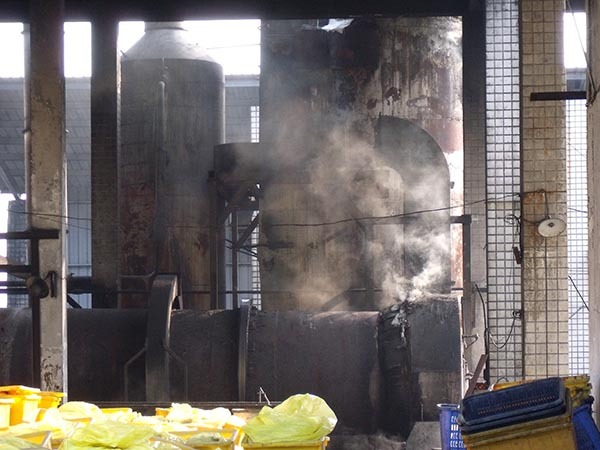 As indicated by the following judicial investigation, a large amount of dioxin was found in the smoke emitted from the plant, negatively influencing the public health . According to the World Health Organization, Dioxin, as a highly toxic chemical compound, could be the cause of “reproductive and developmental problems, damage to the immune system, liver problems and cancer.” Liu pointed out that the risk to public health could not be denied although it was difficult to establish a direct link between the excessive emission and the health problem (ibid). In November 2013, the county court made the first judgment, holding the plant accountable for the pollution and awarding the villagers 6 million RMB in compensation. Later, the plant appealed to the municipal court which affirmed the original judgment of the county court in August 2014 . This case is considered as a rare victory scored by environmental victims in China with a large compensation amount comparing with other environmental lawsuits in recent years, according to Dai, one of the plaintiff lawyers . However, villagers were not satisfied with the result. For nearly 600 villagers who had suffered the pollution for more than 10 years, each of them could only get 6000 yuan for their loss . The plant has resumed operation after rectification. The local residents have moved out of the village and the local government was reported to actively help with relocating the villagers (ibid). Why? Explain briefly. Some experts considered this case as a rare victory achieved by environmental victims in China . However, Liu, one of the plaintiff lawyers noted that it is not a complete victory as the villagers had yet to be paid and no concrete link between the pollution and the villagers’ illness had been established . Besides, villagers were not satisfied with the result despite the large amount of compensation. For nearly 600 villagers who had suffered the pollution for more than 10 years, each of them could only get a mere of 6000 yuan for their loss . Clause 124 of the General Provisions of Civil Law: Any person who pollutes the environment and causes damage to others in violation of state provisions for environmental protection and the prevention of pollution shall bear civil liability in accordance with the law.